The Island Crowne condominium will command your attention from the moment you reach its oceanfront setting in Daytona Beach. The vibrant coral and yellow hues of the exterior of this building are quite impressive and are reminiscent of the colorful sunrise display you can enjoy each morning from the sprawling balconies here. The luxurious Island Crowne offers unparalleled beauty while also being in convenient location to excellent shopping and dining options. Three bedroom units are located throughout this complex, stretching from the oceanfront westward where you’ll also enjoy postcard-worthy river views. Lavishly designed, luxury penthouse units are available on the top floors of the Island Crowne, with some floor plans surpassing 4,000 square feet. Island Crowne residents enjoy the life of luxury with amenities such as private balconies, an oceanfront pool, an indoor pool, granite countertops, high-speed elevators, wall fountain in lobby, state-of-the-art fitness center, saunas and an extensive clubroom. You will truly feel like royalty in your new life at Island Crowne. View floor plans available for sale at the Island Crowne. 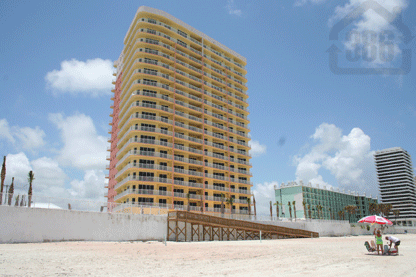 You can't miss the Island Crowne condominium when driving down A1A in Daytona Beach. The colors are very impressive. Tones of pink and yellow cover the exterior of this building making it one of the most unique condo exteriors in Daytona Beach. The location is great as it is just across the street from the Bellaire Plaza and just down the road from some of the best restaurants in Daytona Beach. 3 bedroom units are located throughout this complex stretching from the oceanfront to the west with river views. Very luxurious penthouse units are available on the top floors of the Island Crowne. A few floor plans reach 4,000+ square feet!